Founded in 2000 by Agricola de Cologne, JavaMuseum is a virtual museum for virtual art, net based art – a specific form of digital art based on technologies used in Internet. The date of foundation is playing a particular role, since the Internet became only popular 1999, there were only a few artistic platforms dealing with net based art, so JavaMuseum was not the first project like that, but the first virtual museum acting as a virtual museum. in 2000, the conventional physical art museums did not recognise the relevance of technology based art. There was much more interest in that kind of art from the side of science practiced at US and UK univerisities, before also art museum accepted sometimes, but muich later the computer as a tool for artistic creations. It was a pioneers works, when Agricola de Cologne was curating in 2000 for the first time virtual space and made his own exhibition (interface) design for virtual exhibition space at JavaMuseum. Whenever a new medium is available, artists occupy it for artistic use, and so it was concerning the Internet and net based art, but before 2000, technology was on a very low level, the Internet was extremely slow, and broad bandwidth Internet connection was an Utopia. When Agricola de Cologne entered in 1999 for the first time the Internet, he was using a 28k modem a PC running Windows 98 and a 100 MB harddrive, this was just good for establish a connection to the net, at all. The technological development and the rapid development of technology were changing the conditions for using technology not only in an artistic sense continuously. 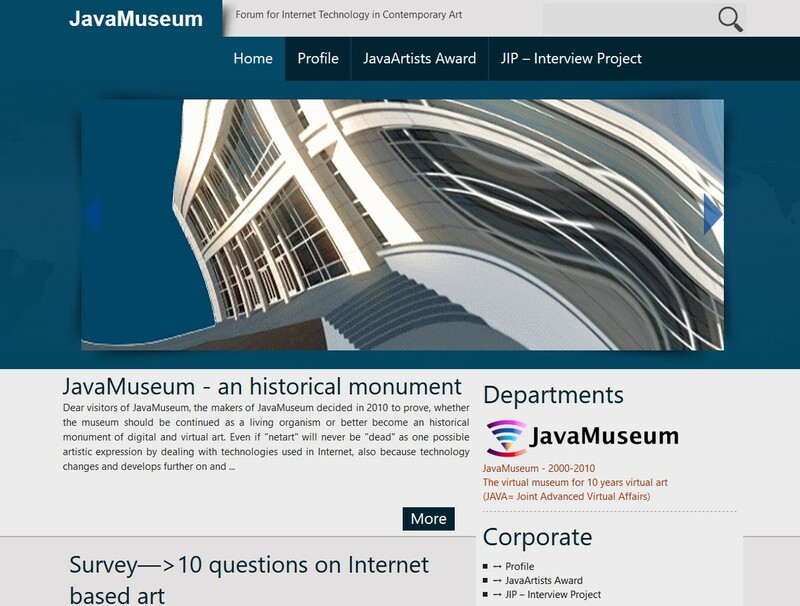 In 2001, JavaMuseum started an annual program consisting of a competition and showcase, giving the JavaArtist-of-the-Year-Award to outstanding artists in the fields of net based art and some featured exhibitions with changing subjects. Until 2005, JavaMuseum organized meanwhile more than 20 showcases of â€œnetartâ€ in a global context, three competitions and many features including more than 1000 art works by 350 artists from 40 countries which form a unique and most comprehensive collection of net based art worldwide and in Internet. JavaMuseum recognized quickly the necessity of collaborations on different levels and started in 2002 a collaboration in concern of the annual competition with University of Manila and Digital Art Festival Manila/Philippines, in 2003 JavaMuseum cooperated with Computer Space Festival Sofia and Goethe-Institute Sofia/Bulgaria. In 2004, JavaMuseum launched the collaboration with [R][R][F]2004–>XP- global networking project and several features of net based art in this framework. Although all these activities were very successful and JavaMuseum got an excellent reputation through these activities, it became evident, that not only the online environment of the Internet, but also the entire global â€œnetartâ€ scene changed during the years. An important aspect represents also that â€œnetartâ€ did not emancipate and is still in a kind of ghetto, not widely accepted as serious form of contemporary art. But also many of the once active artists retired, but new artist generations were not able to replace them in quantity and quality. During 2004, JavaMuseum decided therefore to stop continuing its previous kind of activities by the end of 2004 and complete them by organizing a final show, to be launched in a physical presentations series in Palestine, Israel and Germany in February 2005. JavaMuseum named these activities between 2000 and 2005 the â€œ1st phaseâ€, which will manifest themselves as a project environment encompassing the 18 showcases remaining online for permanent as a documentation of net art 2000-2004. But this extraordinary collection and the involved artists and artworks will also form in future the basis for organizing showcases in physical space in collaboration with physical institutions, as museums or galleries. As the term “netart” has no binding definition, it is good to know, how JavaMuseum is defining this term and its net based activities, thus. Netart is in first place art, a specific form of digital art using specific programming languages/technologies used in Internet. “netart” is not only related to this aspect, but mainly that net based art has to be located in Internet on an URL (Internet address) of itsown, and is this wayit has to be available online to the user at any time . In principle, all technologies/programming languages can be used for artistic creation by programming, but not all technologies are predestined for artists use. Not each artist is a good programmer, and not each programmer is an artist. In this way, many artists use pre-formatted software applications in order to create net based works. There are no general aesthetic criteria, as each technology/programming language has its own specific aesthetics, in addition offer the communicating technologies new options and new and unexpected kinds of aesthetics. But technology represents just a tool, and it is the contents which are as relevant transported and transmitted by using the tool. By defining “netart”, JavaMuseum does not follow any ideology, and is therefore also not restricted concerning contents or technology and open for all subjects and topics artists are working on. 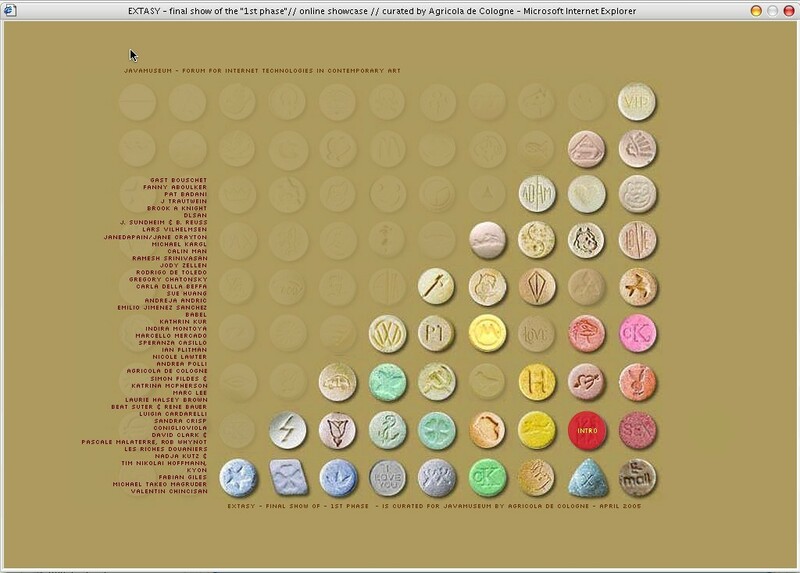 “netart” as it understood and featured by JavaMuseum shows in the global context an unusual variety of presentations and artistic positions and adds a lot of new aspects to the spectrum and general definition of contemporary art. Since 2002, JavaMuseum started a series of neart art features from different cultural regions around the globe and succeeded in presenting many artists who were not in the spotlight before, and gave an idea what could “netart” represent in a global context.